Works of art are intended to inform, educate, elucidate, portray, uncover, and/or challenge a society's way of doing things. It can even go ahead to propose newer ways of doing things and stir a revolution. Any work of art could perform any of these functions. 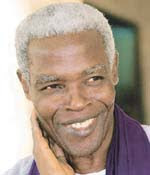 However, Ayi Kwei Armah's works have consistently challenged our collective actions and thoughts as a society. In Two Thousand Seasons, he clearly demonstrated his displeasure by showing clearly our complicity in the enslavement of ourselves coming from our greed and our diametrically opposed stance to 'the way'. In that novel he referred us as Ostentatious Cripples, and those who went into the service of the White Predators as Askaris or Zombies. In Fragments, Ayi Kwei Armah once again tackles the mindset of a society. A society that has lost its focus in life; one that consistently puts materiality above morality; one that has sold its core values in return for flashes of enjoyment, even if those flashes lead to corruption and rot in the society. Baako, being a been-to (a person who had come from abroad), is expected to act as one: to live in a huge mansion, drive big cars, and shower gifts on his family members. Yet, Baako, a pragmatist, has a divergent opinion. His coming back home was with trepidation as to what he would discover or uncover, what he would do with himself and the expectations of the people around him. His point of entry into the country presented him with the collision course he would be on with the forces that drive the notions and thoughts of people, for it wasn't long that the sister of a friend he had met whilst enplaned to Ghana, told him that he does not look like a 'been-to'. Furthermore, in less than 24-hrs later, a lady friend of his friend and his mother, at different places, asked to be wheeled out when his car arrives. Here, Ayi Kwei Armah clearly depicts the mentality of the people without being direct, for both had presumed that Baako has a car, which would soon arrive; because every been-to has a car. "Nothing works in this country ... The place is run by this so-called elite of pompous asses trained to do nothing. Nothing works ... It isn't even that things are slow. Nothing works. ..."
Unable to handle his growing frustration, the demands from his family, the diametrically opposing views (his and society's), Baako finally cracks and is bundled and dumped at a psychiatric hospital. The clash between cultures and generations also came not as a surprise. Naana (his grandmother) and Juana (a psychiatrist and a psychologist) understood Baako, whilst Efua (his mother) and Araba (his sister) wanted him to be a real been-to. Yet, Naana, Baako's grandmother, belongs to the old generation and therefore Baako scarcely talks to her or takes her words seriously. Besides, her conversations are always embedded in the spiritual realm. Juana had her own set of problems, yet she was the one Baako could confide in. In Fragments, the maternal inheritance system as practised by the Akan ethic group comes alive, as Baako's father, whether dead or alive was not mentioned. Besides, Kwesi, was also a passing character. According to Naana, "A father is only a husband, and husbands come and go; they are passing winds bearing seed. They change, they disappear entirely, and they are replaced. ..."
Imperceptibly, the writings of Ayi Kwei Armah are similar to that of Stephen King, not in content but in the boldness with which he tackles any subject and make it come alive, the boldness with which he fearlessly experiments, the boldness with which he pens down his narratives. Yet, the description of the processes leading to Baako's psychotic condition reminded me of King's Roadwork. The passion, the clarity of events, the resistance to society's norms and the breakdown make you wonder if Armah had been in such a condition before. This plot in the hands of some novelists might end up a boring piece. Like a classical piece or an opera performance, Armah's works are to be loved or loathed. However, relatively I seemed to have enjoyed 'Two Thousand Seasons' much more than I did enjoy this. This may be because I delved into Fragments, with the heavy narrative of TTS in mind, as only one book separates these two readings. I would recommend this book to anybody who wishes to know society's 'stated' expectations and all those who just love to read.